Mermaids are big again. So big in fact, that we can’t go anywhere without the little one thinking she’d like to be a mermaid when she grows up. 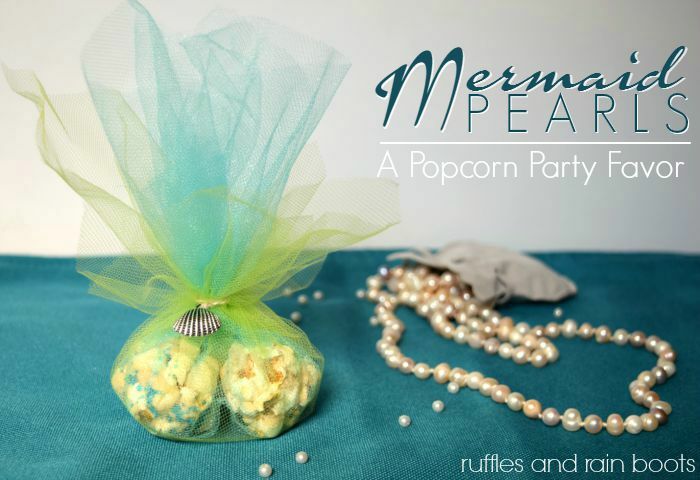 We whipped up a mermaid party favor that will have all of the little mermaids raving! 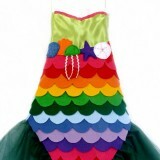 The little one is seriously crushing on mermaids right now – this is her favorite thing to wear. Every. Day. 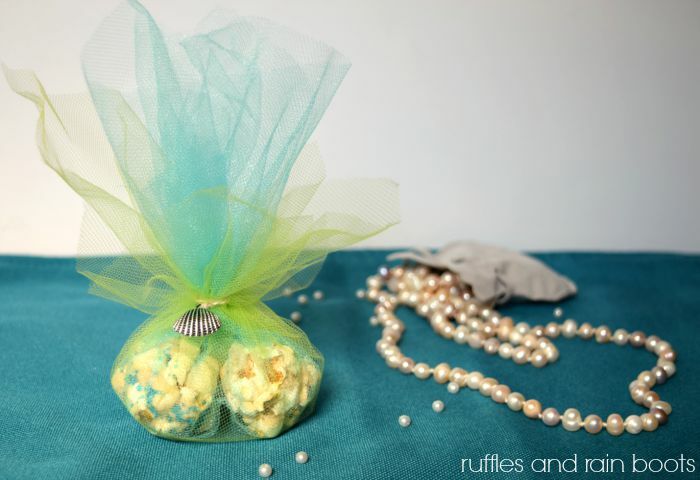 For a mermaid-themed play date, we made some sparkly, sweet popcorn ball mermaid party favors wrapped up in a 3 year old’s version of mermaid happy place. In case you are in desperate need of a chef’s hat – apparently, we were – use this great video to make one for your kids. It took less than 5 minutes and the only supplies are copier paper, parchment paper, tape, and staples! 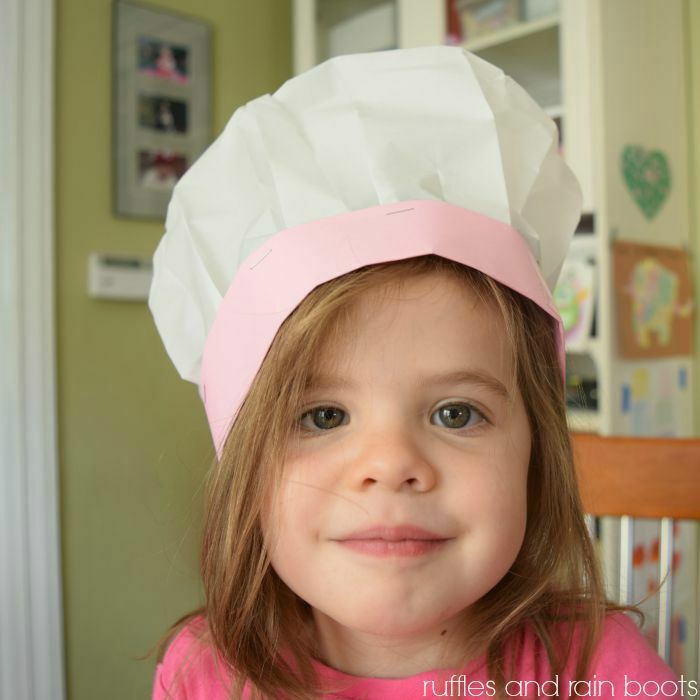 Here’s my uber-tired little one in her chef hat craft! 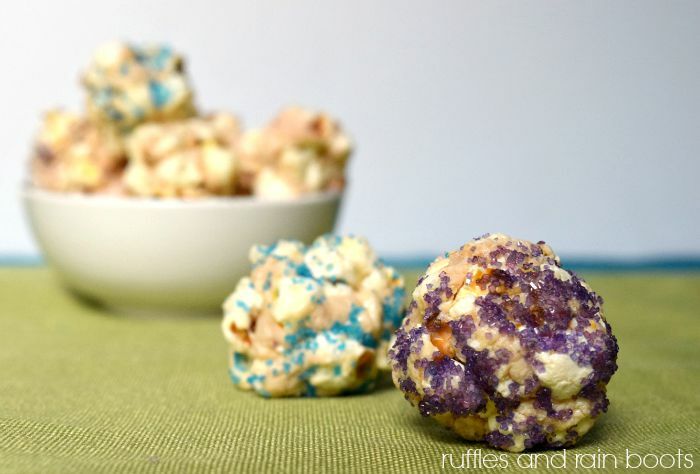 This was the first time I used this popcorn ball recipe and they definitely taste great! If you like toasted marshmallow, this should be a much-welcomed addition to your treat box. Use a heavy pot and melt the butter over very low heat. Add in the candy melts (I melted mine while waiting for the butter). Add the marshmallows and stir until your marshmallows are mostly thinned out and melted into the candy and butter. Add in 5 cups of popcorn and lightly stir to coat. Take it off the heat and let it cool for a bit. Butter your fingers and shape the mixture into just smaller than golf-ball-sized popcorn balls. This recipe made 15 balls. 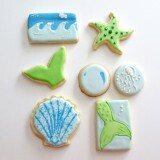 If you’re more of a cookie person, consider making these oh-so-tasty mermaid and ocean themed decorated sugar cookies. They went fast! Pro Tip: In case you don’t have enough time (or desire) to make cookies from scratch, use a mix or a refrigerated dough as a starter. When you’re going to make a mermaid party favor, it’s never a bad idea to add some tulle. My littleone goes berserk for tulle, so it was no surprise to me that it was the wrapping she reached for. I cut a square of light green tulle and had Elise cut a larger square of light blue tulle. It’s always good to work on scissor skills with the preschooler because you never know when they’re going to try and cut their own bangs. 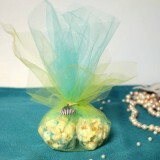 Taking three popcorn balls, we wrapped them in the green tulle first and covered that with the blue to create a single mermaid party favor. 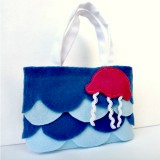 I secured it with a bit of twine and an inexpensive ocean-themed charm. So what do you think? Easy enough? I tell you, they went fast around here and Elise even made a necklace with her charm! Because we’re always adding to it, you can follow our Mermaids Pinterest board here. 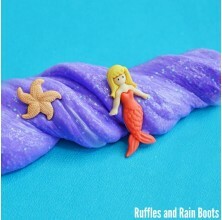 Follow Ruffles And Rain Boots – Sarah’s board Mermaids on Pinterest. If you have a party board or even an “everything mermaids” board on Pinterest, will you please share this with your followers? Good Evening Sarah!! Just popping in to let you know your post has been picked as a feature at the Welcome Home Wednesday Link Party! Stop by tomorrow morning to see your feature and link up! Don’t forget to grab your “Featured Button” too! Thank you so much for the feature, Lisa! I’ll definitely be stopping by to the party tomorrow. Your mermaid party is adorable =) My daughter is so caught up in Elsa right now, but if she weren’t an ice princess, I’m positive she would be a mermaid. Thank you for sharing with us on Welcome Home Wednesday! I hope you’ll come back to visit us again next week! Oh my goodness, this is so very awesome. My girls haven’t gotten into the mermaid thing yet… can you believe we haven’t watched The Little Mermaid?! What’s wrong with me? I’ve dropped the princess ball. Jennifer | The Deliberate Mom invites you to read Beautiful Autumn Subway Art (Free Download)! Those gift bags are the cutest! We haven’t ever left the mermaid stage. 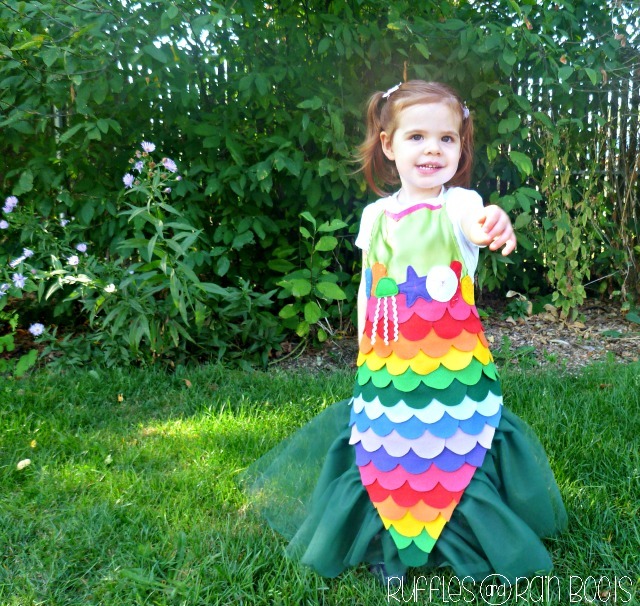 My oldest wants one of those fancy mermaid tails you can swim in!